Plot: When her game is threatened Vanellope and Ralph head into the internet to try and rescue it. 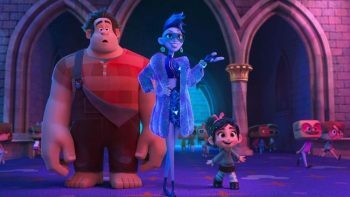 Inventive, colourful and smartly-funny, Ralph Breaks The Internet is one of the most satisfying and funny family films in recent memory. Why have Disney brought up every major franchise going? From Marvel to LucasFilm Disney have swallowed them all up, why? Yes, well done to make more money, but based on this evidence to also allow all those products occupy, dominate and rule one space. Online. So it makes sense that Disney also have a little fun with it. 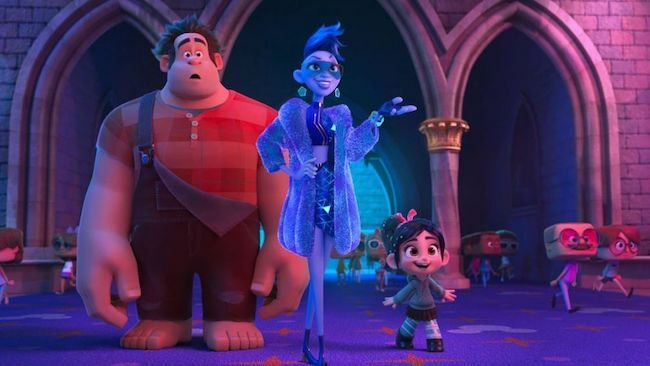 Step forward Ralph Breaks The Internet. Six years after Wreck It Ralph, Ralph (John C. Reilly) and his best friend forever Vanellope (Sarah Silverman) have formed a happy life flitting from game to game. But when Vanellope’s game looks like it might be discontinued in the arcade the pair head into the internet to see if they can fix the problem. What they uncover is a world of possibilities and one they are ill-equipped to handle. The first Ralph film was a smart little examination of a move to something more complex in the gaming world, a kiss goodbye to nostalgic moments that defined a childhood in favour of something more point, aim and kill. 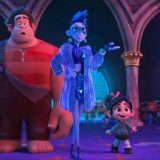 In Ralph Breaks The Internet we are given a satirical look at the world wide web. Yes, on one hand it can be seen as a cute little story about best friends finding they don’t have to do everything and share everything to still be friends. But that in itself hints at what the internet has become. A sense of validating our lives through the chaos that is social media. It is rare for a film to manage to so universally appeal to adults and children in such effective but such different ways. The colours, adorable characters and breakneck adventure will appeal to the younger audience members. Meanwhile the pastiche social commentary tick all the boxes for the grown-ups. And then there are the scenes that will have both laughing with pure pleasure. Any film that manages to include a scene in which a host of Disney princesses talk through their most obvious troupes but still end up owning their feelings should be celebrated. It also contains a Disney awakening song wonderfully named A Place Called Slaughter Race.